South Korean Foreign Minister Kang Kyung-wha met her Chinese counterpart Wang Yi in Beijing on November 22. 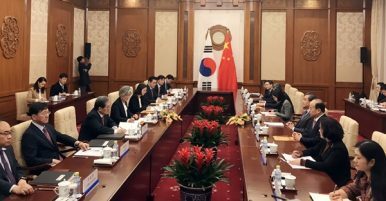 Both countries’ foreign ministers met in Beijing, paving the way for the South Korean president’s first visit to China. Ahead of South Korean President Moon Jae-in’s first trip to China next month, South Korean Foreign Minister Kang Kyung-wha met her Chinese counterpart Wang Yi in Beijing on November 22. According to the South Korean Ministry of Foreign Affairs, Kang and Wang had a five-hour “in-depth and candid” talk over various topics. From China’s perspective, the issue of the Terminal High Altitude Area Defense (THAAD) deployment was the top priority during the talk. Beijing has vociferously protested deployment of the U.S. missile defense system to South Korean soil, claiming it threatens Chinese security interests. According to the Chinese Foreign Ministry’s statement, Wang repeatedly urged Kang to stay committed to its earlier consensus on solving the THAAD issue. “There is a saying in China that promises must be kept and action must be resolute. We hope that South Korea will continue to properly handle this problem,” Wang said. The consensus Wang referred to was the joint statement issued by China and South Korea on October 31. While the South Korean statement was purposefully vague, the Chinese side claimed that Seoul agreed not to deploy any more THAAD batteries, not to join the U.S. missile defense system in Asia, and not to engage in trilateral military cooperation with the United States and Japan. The U.S. government has been trying to strengthen not only U.S.-Japan but also U.S.-Japan-South Korea trilateral security cooperation with unprecedented exercises. During the latest meeting, Wang intentionally repeated South Korea’s commitments and emphasized that “China attaches importance” to Seoul’s position. As for the other most important issue, the North Korean crisis, neither party revealed much about their discussions in that regard. According to the Chinese side, both ministers “exchanged views on the Korean Peninsula nuclear issue.” Wang and Kang agreed that both countries share common interests in realizing the denuclearization of the Peninsula and safeguarding peace and stability on the Peninsula through dialogue and consultation. As The Diplomat reported earlier, on November 20, Song Tao, Chinese President Xi Jinping’s special envoy, wrapped up his four-day visit to North Korea. Song apparently failed to meet with North Korean supreme leader Kim Jong-un, although neither North Korea or China would confirm or deny that. Meanwhile, Air China Ltd indefinitely suspended flights between Beijing and Pyongyang soon after Song’s visit. Many observers thus posited that Song didn’t fulfill the mission of bringing North Korea back to the negotiating table. In addition, the South Korean Foreign Ministry disclosed that prior to both foreign ministers’ meeting, Kang had a luncheon with Chairperson of the Foreign Affairs Committee of China’s National People’s Congress Fu Ying. Both women “exchanged views on a wide range of issues” regarding mutual relations. It’s worth mentioning that Fu has been actively explaining China’s dilemma and concerns about the North Korean issue to the international community in an approachable way. It’s likely that Kang was trying to better understand China’s position through her conversation with Fu. Will Xi Jinping Visit North Korea This Year?From Pyongyang to Hanoi: Kim Jong Un’s Long March Through ChinaKim Jong Un to Make Third Trip to China, One Week After Singapore Summit With TrumpThe Trump-Kim Summit: Good News for ChinaNorth Korea and China, Friends Again?